The OKI 675001DIP is a compact module containing an entire ARM system including SDRAM, Flash, User programmable CPLD, RTC, Serial, JTAG and numerous other features. This board is a flexible solution for many aspects of design and usage with the OKI 675000 series MCU. It represents a solution that has enough features to be used as a prototype board enabling the rapid development of products and is cost effective enough to be used as a small to medium integrator solution. Customisable manufacturing options allow the board to be used, even in cost sensitive applications. Modular design ensures when the board is used as an integrator solution costs can be saved by simply omitting the unnecessary functionality. In addition to the ample core features of the ML675001 MCU, the EB675001DIP module adds SDRAM, flash and 10/100Mbit networking. This allows a complete solution to be developed within a tiny 37 cubic cm volume. The extremely robust design approach taken with this module ensures it can be used for both prototyping and integrator solutions. The 5V tolerant I/O buffering used throughout together with the easily accessed 0.1 inch pitch connectors allow for the integration even in the most basic of environments. Prototyping of solutions with wirewrap and stripboard is possible with a minimum of fuss allowing for a "hands on" iterative approach to solving a design problem. To ensure the module has the absolute maximum in flexibility the addition of a Xilinx XL9572XL CPLD, which can be programmed as the user sees fit, gives almost unlimited application. By providing examples of use and Xilinx webpack templates the effort required to use this technology is also reduced. To ensure the user gets the most they can from the EB675001DIP a comprehensive set of resources is available which includes a wide range application notes and documentation. The ABLE bootloader is available on this board making development and supported functionality the same as on our larger products. The bootloader can boot the provided uCLinux images and allows for more rapid development by network booting test software. Simtec's commitment to complete solutions means development time for a wide range of embedded solutions can be reduced to a minimum. The supplied support CD comes with uCLinux cross build environment. This environment allows developers to rapidly progress in the production of the customers target application without spending excessive setup and configuration time. 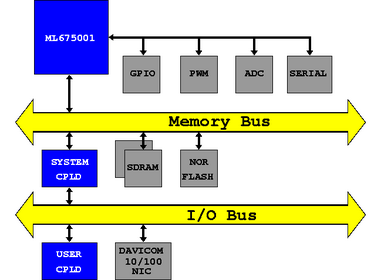 Specification - A list of all the OKI 675001 Module specifications. Resources - Documentation and software resources for the OKI 675001 Module. Firmware - Firmware for the OKI 675001 Module. FAQ - Frequenty Asked Questions about the OKI 675001 Module. Application Notes - Application notes suitable for use with the OKI 675001 Module. Gallery - Images of the OKI 675001 Module.